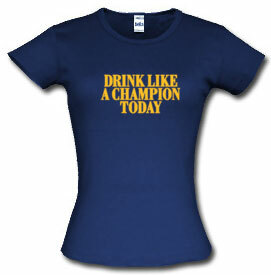 Every once in a while a t-shirt trend starts that gets HUGE. We all remember how the movie Napoleon Dynamite created one of the largest t-shirt trends in internet history with the t-shirt that read Vote for Pedro. The movie was a cult classic and the t-shirt that was worn by Napoleon in the movie became an instant classic. As a fan of Napoleon Dynamite I can understand why the t-shirt became so popular. But what is the deal with this trend of Chuck Norris T-shirts? Overture shows that over 3440 people just on the Yahoo network searched for a Chuck Norris T-shirt last month. Chuck Norris whose show Walker, Texas Ranger went off the air over 5 years ago and is just a guy on informercials. Then why the craze? Shops at Spreadshirt has featured Chuck Norris T-Shirts many times and even has a top spot on their new Visual Buying Guide. The visual guide as reviewed on T-Shirt Talk has a 250 club. Basically if a designer at Spreadshirt sells over 25o of a particular design they join the “250 club” and get extra exposure. This Chuck Norris t-shirt has also been included in Spreadshirts 250 Club along with Drink Like a Champion t-shirt as seen above. Right now there are only two shirts at Spreadshirt that have that honor. Is Chuck really that cool? A site called called Chuck Norris Facts has some info on Chuck and has the option to customize your own Chuck Norris T-Shirt customized. What has this world come to? Can someone please explain to me the Chuck Norris craze? 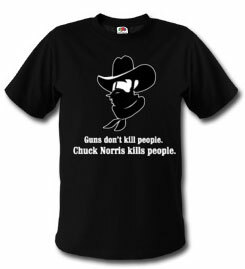 How do people on Spreadshirt get away with using Chuck Norris’ name and likeness? Isn’t that copyright infringement? Good question Burn. It is hard to say. They may have his permission. If they don’t they could risk a legal battle. But at the same time Chuck Norris could use all the publicity he can ger since he is not exactly “peaking” in his career so maybe he would just let it fly. Maybe Chuck will make his comeback on a new reality TV show.